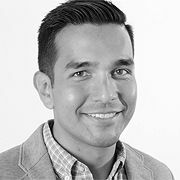 Edwin began his RedBox journey creating and implementing an “Inspiration Hunters Area”, a team in charge of researching the most relevant trends, case studies and data. Two years later in 2011 he became Innovation Consultant, a role in which he has led strategic innovation projects for more than 40 brands in over a dozen industries. He now works to change the way RedBox delivers projects. After obtaining a Bachelor in Industrial Design from the Universidad Iberoamericana in Mexico, Edwin studied an Undergraduate course in Design thinking, Transportation and Product design at the Art Centre College of Design in California. He began his work experience in 2006 by founding a company, which supplied materials to Design students in universities across Mexico, and continued his career at APTO/Frank Mayer and Forespot before joining RedBox Innovation in 2009.